Miranda was the stoppage-time hero for Brazil as his header gave Brazil a 1-0 win over Argentina in a low-key Superclasico de las Americas clash. Until then, Nicolas Otamendi's last-ditch denial of Miranda in the first half had been the closest Lionel Scaloni's men came to conceding for the first time since the World Cup. Brazil's dominance of possession in the first half did not keep Giovani Lo Celso and Paulo Dybala from threatening with efforts that both flashed past Alisson's left post. Miranda went closer to breaking the deadlock between those chances when Casemiro's cross dropped kindly at the far post, but Otamendi was perfectly positioned to head the defender's close-range finish off the line. Alisson dealt comfortably with a Lo Celso header soon after the interval and was spared another save courtesy of Danilo's block on Mauro Icardi, although the incident did leave the Brazil right-back limping to the bench. Neymar finally found room to stretch his legs in the 69th minute only to be cut down by Renzo Saravia, with Sergio Romero required to beat away Arthur's volley from the resultant free-kick. Despite the defeat a lack of fluidity, Argentina's work ethic, general defensive organisation and ability to threaten on the break suggests Scaloni is having a positive influence in his capacity as interim coach. 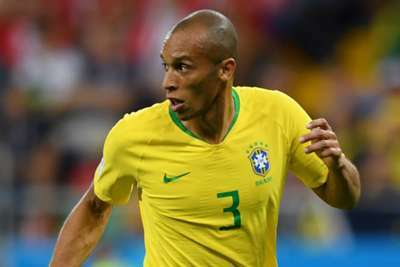 Brazil's listlessness going forward meant a different source was going to have to provide the goal and Miranda did just that, improving on his near-miss in the first half with a decisive late intervention. Tite's move to unite Neymar, Roberto Firmino and Gabriel Jesus in a front three promised plenty on paper, but in execution the trio lacked any kind of coherence. The Brazil boss is still searching for his best combination.